Differential geometry is the study of curved spaces using the techniques of calculus. It is a mainstay of undergraduate mathematics education and a cornerstone of modern geometry. It is also the language used by Einstein to express general relativity, and so is an essential tool for astronomers and theoretical physicists. This introductory textbook originates from a popular course given to third year students at Durham University for over twenty years, first by the late L. M. Woodward and later by John Bolton (and others). It provides a thorough introduction by focusing on the beginnings of the subject as studied by Gauss: curves and surfaces in Euclidean space. 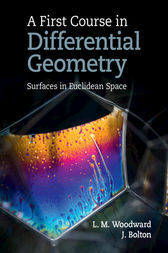 While the main topics are the classics of differential geometry - the definition and geometric meaning of Gaussian curvature, the Theorema Egregium, geodesics, and the Gauss–Bonnet Theorem - the treatment is modern and student-friendly, taking direct routes to explain, prove and apply the main results. It includes many exercises to test students' understanding of the material, and ends with a supplementary chapter on minimal surfaces that could be used as an extension towards advanced courses or as a source of student projects.